Fort Myer, Virginia, traces its origin as an Army post to the Civil War. It has been an important Signal Corps post, an Army cavalry site, the site of the first flight of an aircraft at a military installation, and the first military air fatality. It has also served as the home of Army Chiefs of Staff for nearly a century. The acres surrounding Fort Myer and adjacent Arlington National Cemetery were called Arlington Heights when they were owned in the 1800s by Mary Anna Randolph, great-granddaughter of Martha Washington. Mary Anna Randolph married Robert E. Lee when he was a young Army lieutenant. Lee helped save the estate from financial ruin in 1858, but he left the area in April 1861 to join the Confederate Army, never to return. The land was seized by the federal government for military purposes when the Lees were unable to pay their property taxes in person. Part of the estate became Arlington National Cemetery and the remainder Fort Whipple, named in honor of MG Amiel Weeks Whipple. Looking out over Washington, DC, Georgetown, and Northern Virginia, Fort Whipple was considered one of the stalwart fortifications built to defend the Union capital during the Civil War. Its first occupants were artillery and infantry units housed in tents and other temporary structures. The Signal Corps took over the post by the late 1860s because the fort’s high elevation made it ideal for visual communications. In 1881, Fort Whipple was redesignated Fort Myer in honor of BG Albert J. Myer. 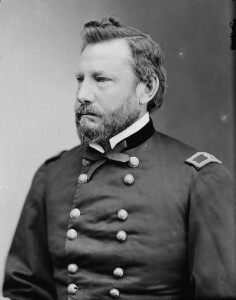 During his career he served as commanding officer of Fort Whipple and was appointed the Army’s first chief signal officer in 1866, a position he held until his death in 1880. The post was renamed primarily to honor Myer, but also to eliminate confusion raised by the existence of a second Fort Whipple in Arizona. For the next five years, Signal Corps troops continued to man the post. Then in 1887, GEN Philip H. Sheridan, the Army’s commanding general, decided to transform the post into the cavalry showplace of the nation. He transferred the communications unit and assigned horsemen to the post. During the next twenty-two years, Army horsemanship became an important part of the official and social life in Washington. As many as 1,500 horses were housed at Fort Myer during this time. The first military test flight of an aircraft was made from the present-day parade grounds in September 1908. Orville Wright succeeded in keeping the plane aloft for one minute and eleven seconds. The second test flight, which lasted over four minutes, ended with a tragic crash. Orville Wright was severely cut and bruised, while his passenger, 1LT Thomas Selfridge, became the first powered aviation fatality. Most of the buildings on the northern part of the post were built between 1895 and 1908. Many of the buildings constructed during that period still stand and have been designated historic landmarks by either the Department of the Interior or by the State of Virginia. No history of Fort Myer would be complete without mentioning Quarters One, the residence of the Army’s senior uniformed officer. Completed in 1899, it was originally designated to serve as the post commander’s house, but has been home to the U.S. Army Chief of Staff since 1908. Since that time, it has been home to several famous American soldiers, including Douglas MacArthur, George C. Marshall, Dwight D. Eisenhower, Omar N. Bradley, William C. Westmoreland, and Creighton W. Abrams. During World War II, Fort Myer served as a military in-processing and out-processing station. Troops were also stationed there throughout the war to provide defense to the nation’s capital. The U.S. Army Band, “Pershing’s Own,” moved to Fort Myer in 1942. Six years later, two battalions of the 3d Infantry Regiment, the oldest regular Army regiment, were reactivated and assigned to Fort Myer and Fort McNair. Though only one battalion is active at Fort Myer today, the regiment known as the “Old Guard,” is the Army’s official ceremonial and security force in Washington, DC. The Fort Myer Military Community (FMMC) provides housing, support and services to thousands of active-duty, Reserve, and retired servicemen and their families stationed in the National Capital Region. Fort Myer is the FMMC garrison headquarters, which includes Fort McNair in Washington, DC. Today, Fort Myer’s mission is to operate the Army’s showcase community and to support Homeland Security in the nation’s capital.